One of the best solution to get away from Eyeglasses scratches. This patch covers Finder eyepiece for FED-2. No More Scratches on your Eyeglasses. The material is roohide, velour, black color. 0.8mm thickness. 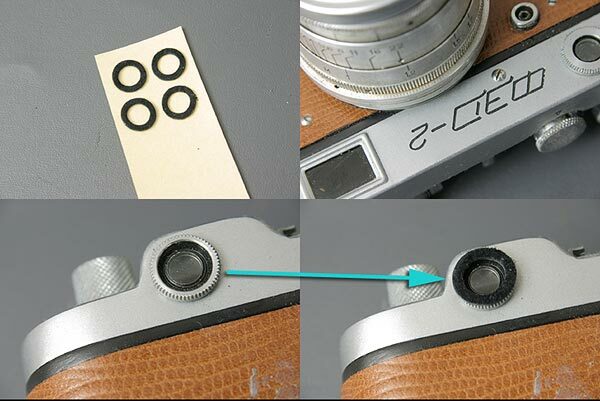 Just remove the patch from the base paper, then apply on the Viewfinder Eyepiece. Self Adhesive, you do not need any glue for installation. This patches fit to FED-2, NOT fit to the other Cameras. The adhesion is not strong, it will not hurt surface of your camera. Easy to remove when de-install.